The Rhizopshere is a dynamic and complex environment where microbes, plants, through their roots, and soil elements interact. This Rhizopshere with an abundance of life, is an environment rich in microbial diversity, and is physically, chemically and biologically different from soil deeper in the profile. It is this direct link between plant and microbes which makes this area so unique. 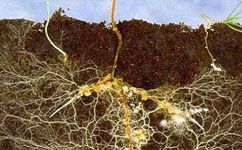 The microbes in the rhizosphere are under direct influence of plant roots, which release organic material, mainly as root exudates. These exudates serve as substrates and food for the microbes. On the other hand, microorganisms associated with plant roots, either free or symbiotically living, help the host plant to adapt to stress conditions concerning water and mineral nutrition and soil-borne plant pathogens. Mycorrhizal fungi can be difficult to establish and are notoriously susceptible to management issues such as heavy tillage, Agri-chem use, over fertilisation and overstocking. The establishment of mycorrhizal association is affected by other microorganisms of the rhizosphere, specifically by bacteria. There are a number of different bacterial strains which have a beneficial effect on colonisation and help to establish this plant-soil link. These bacteria are referred to as Mycorrhization Helper Bacteria (MHB), referring only to bacteria that promote the establishment of root-fungi symbiosis. Some of these MHB stimulate the process of mycorrhiza formation and others interact positively with the functioning of the already-established symbiosis. How does EM affect Fungi-Soil Symbiosis? EM being a combination of Bacteria, Fungi and Yeasts will help the decomposition process of organic materials, and during fermentation will produce normally unavailable organic acids, such as lactic acid, acetic acid, amino acid, malic acid and bioactive substances and vitamins. These substances stimulate native microorganism populations and are known to promote plant cell division (growth). The growth of spruce-associated micro-organisms in a strain specific manner. The combination of antifungals produced by the one particular strain in EM provides a broad spectrum of antifungal activity that protects the mycorrhizal roots from fungal parasites, and selects against mycorrhizal fungal competitors.